Construction is underway for the new Alpha Xi Delta house on Plum Street. 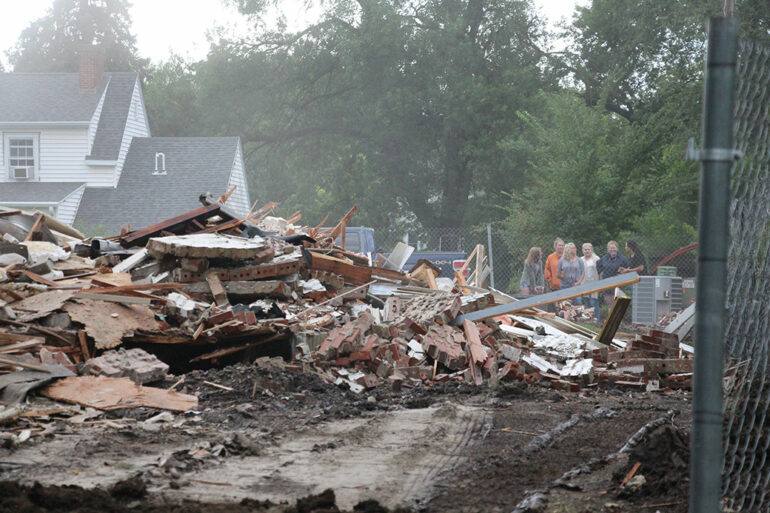 The old sorority house was torn down Monday. In the meantime, sorority members are living in a temporary house off campus while waiting for the new house to be built in what will be a $2.6 million project. Karli Stephenson, a junior strategic communications major, said the USD chapter of Alpha Xi Delta hasn’t had a new house in 87 years. “It’s definitely sad, but knowing that we’re going to get a new house within the next year is really exciting,” Stephenson said. Sorority members had a hard time deciding whether or not to sign the university’s housing agreement knowing their house was going to be torn down. Stephenson faced a similar decision when it came to living in the sorority house for two years. Mostly, Alpha Xi Delta members are excited to have their home away from home.